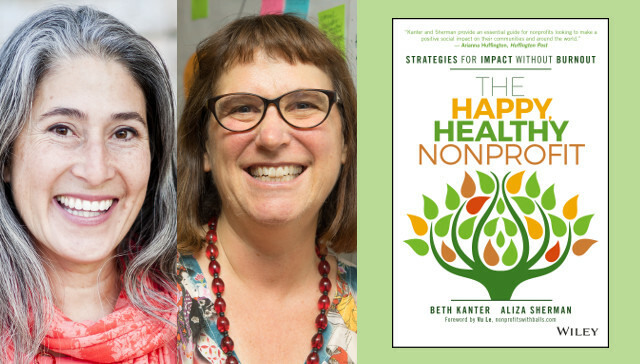 Beth Kanter and Aliza Sherman are co-authors of The Happy Healthy Nonprofit: Strategies for Impact without Burnout. Beth Kanter (@kanter) was named one of the most influential women in technology by Fast Company and is the award-winning author of The Networked Nonprofit books. She is an internationally acclaimed master trainer, speaker, and author of top rated Nonprofit blogs, Beth’s Blog. Aliza Sherman (@alizasherman) is a web and social media pioneer; founder of Cybergrrl, Inc., the first women-owned, full-service Internet company; and Webgrrls International, the first Internet networking organization for women. She is a motivational keynote speaker and the author of eleven books, including Social Media Engagement for Dummies. 1MFWF: People unfamiliar with the nonprofit world might assume that they’re full of happy, healthy people—after all, nonprofits aren’t driven by corporate greed, and generally exist to make positive contributions to the world. Doesn’t that mean everyone’s always in a good mood? Beth and Aliza: Nonprofits may be mission driven, and the people who work within them are likely to be driven by a passion for their organization’s mission, but “passion for mission” doesn’t directly translate into “happy and healthy.” In fact, you can love your job and still experience stress. The culture of nonprofits tends to treat self-sacrifice and “giving it all to the mission” as noble. Pair that with limited resources to tackle the overwhelming demand for “doing good,” blurred boundaries between work and down time, and unrealistic expectations, and you’ve got the perfect storm for burnout. It’s hard to be in a good mood or even to sustain the energy and drive you need for your work when you’re stressed out and on the verge of burning out. 1MFWF: How does flexible work help build a happier, healthier organization? How does self care factor into that? Beth and Aliza: In our book, we give many examples of how changing the culture at organizations to be attentive to the wellbeing of staff can have a positive impact on everything from attitudes and productivity to talent retention to outcomes. Many leaders at nonprofits have initiated this change by having explicit conversations with their employees about what is needed to build this type of culture and working environment. Flexible work, especially for employees who have families and want to maintain work/life balance is an appealing benefit. More typically in the nonprofit sector, we see the use of flex space or the ability to work outside the office. It is on a continuum from allowing staff work at home one or two days week to virtual workplaces where everyone is working from a home office. For example, MomsRising is run by a small staff working virtually from their home offices around the country. Almost everyone on staff is a parent, so having a flexible workplace helps staff juggle the demands of full-time work with parenting. MomsRising has also worked hard to create culture where there is no judgement when the inevitable overlap between real life occurs. But a virtual workplace doesn’t mean zero accountability. Staff is expected to be available during normal business working hours when needed and deliver on their work tasks. While the organization has an expectation of a 40-hour work week, staff members are free to structure their schedule to their needs as long as they deliver. 1MFWF: What did you find works best for workers who want to ask for more flexible work schedules? Is that strategy unique to nonprofits? Beth and Aliza: It doesn’t matter whether an employee works for a nonprofit or corporation, but when employees need flexible work, their best strategy is to ask their supervisor and explain why and to work out mutually beneficial options. Some workplaces may already have a clearly articulated policy for flexible work and others may need to formalize one. One of the nonprofit professionals we interviewed for the book was Carie Lewis Carlson, Director of Social Marketing at The Humane Society of the United States. She asked for a more flexible work schedule after having her first child. She spoke openly with her boss and explained she was struggling to get some balance in her life, and asked if she could try a part-time, work-from-home arrangement for a one-month trial. Her boss agreed, and now Carie works from home twice a week. Another nonprofit professional we interviewed was NTEN’s Education Director Ash Shepherd. He asked for multiple accommodations in his schedule to better align with his children’s school schedules. He works from home a few weeks at a time. He says the flexibility allows him to balance the needs of work and his children without feeling stressed. And his organization benefits because he can bring his best to his job. 1MFWF: In the book, you walk through several different models of flexible work. Can you describe those? And are certain models more effective than others? Beth and Aliza: Nonprofits have experimented with a variety of approaches to flexible work that include flexible hours and flexible locations such as working from home, virtual offices, self-scheduling, shift trading, and telecommuting. The nonprofits that were successful in sustaining flexible work found that supportive managers and the assurance of no job jeopardy if an individual chooses the option to work flexibly were critical. Results Only Work Environment or (ROWE). ROWE is considered the ultimate flexible work model. The organization sets no standard hours and no mandatory (and time wasting) meetings and doesn’t require staff to get permission to take personal time to attend a family event. The only requirement is that do their deliver work tasks and get results. Four-Day Workweek. The four-day workweek is exactly that: Staff work four days each week but for longer hours. In return, they get three-day weekends. There is no silver bullet solution for flexible work. You first need to assess the culture of your organization and workplace environment. You need to examine attitudes and habits, good and bad, and be honest about the challenges staff is facing. More flexible work schedules can relieve a lot of pressure and provide room for people to have more balanced lives but only if it is accepted by everyone the organization and available to everyone. And keep in mind that even if your organization says they allow flex time, culturally it could still be frowned upon and viewed as lacking dedication or shirking responsibilities and putting them on others. So there can be potential downsides to implementing flexible work options. For every change that provides relief and creates joy in the workplace, there can be some negative reactions to change, no matter how positive it might be. We believe that encouraging employees to practice self-care and creating a culture of wellbeing in the workplace are strategic imperatives and part of high performance work.